I’m making a graphic design assignment for class; it’s a stage design that reflects an event campaign I’ve been working on (see the invitation, sweater, and tickets on Behance). Any obvious things which could be improved before this is due in a week and a half? I’m going to turn down the cement’s shine. I’m also thinking of adding a trolley for the speaker to have all his materials. Any other stage elements that could be added? 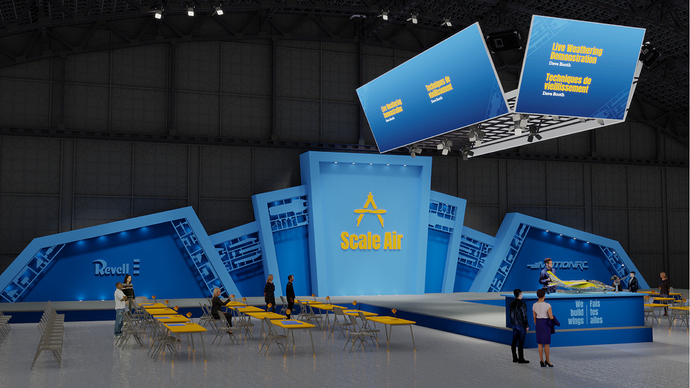 I’m also thinking of including the stage in multiple configurations (exposing winning airplane models, for instance, without the tables). Looks nice, I will study in detail tomorrow and welcome to BA! One thing, rows of chairs and desk would never be dead straight, or exactly even spacing. Yes, I’ll definitely fix that. One thing that catches my eye is the presence or absence of “3D cues.” You need to be very sure that the characteristics which imply depth are there – so that the eye doesn’t interpret it as a 2D arrangement of shapes (which, in fact, it is). For instance, right now the “overhead hanging thing” touches the vertical backdrop … two-dimensionally speaking. The right edge of the stage, similarly, coincides with the stage that in real life is supposed to be extending toward the viewer. In this case, careful choice of camera angles … perhaps, very slight(!) adjustments … might make a great deal of difference. Also consider your choice of lens f-stop – wide, normal, or zoom. Yes, you probably want to have the set “fill the frame,” as you are doing now, but there are many ways to consider doing that. So you are suggesting to move the camera slightly to the left so the catwalk hides the stage’s right wing, and move the projector screens slightly higher so they don’t coincide with the backdrop?